Throw a dart at a list of the stocks in the S&P 500, and odds are pretty good that you'll hit a ticker symbol that's down in 2016. As of Thursday's close, 425 of the stocks in the S&P are down since the calendar flipped to January -- and about half of those are down double-digits or more. Put simply, it's been an ugly year to be a stock market investor so far -- and it's not even February yet. But while the majority of the stocks in the market right now are down in 2016, a very distinct subset of those looks downright "toxic" this year. And making sure that those serial laggards aren't in your portfolio could be key to surviving the market rout as we head into a new month. To identify the stocks you really don't want to own right now, we're turning to the charts for a technical look at five big-name stocks that are starting to look toxic. So without further ado, let's take a look at five "toxic stocks" to sell. Up first on our list is NRG Energy (NRG - Get Report) . NRG has been selling off all year long, down more than 59% in the last 12 months. The bad news is that the selling may not be over yet. A classic technical setup points to more downside ahead in NRG. NRG is currently forming a descending triangle pattern, a bearish price setup that's formed by horizontal support to the downside (at $9 in NRG's case), and downtrending resistance up above shares. Basically, as NRG bounces in between those two technically significant price levels, shares have been getting squeezed closer and closer to a breakdown through our price floor at $9. If shares violate that line in the sand, then NRG suddenly opens up a whole lot more downside risk in February. 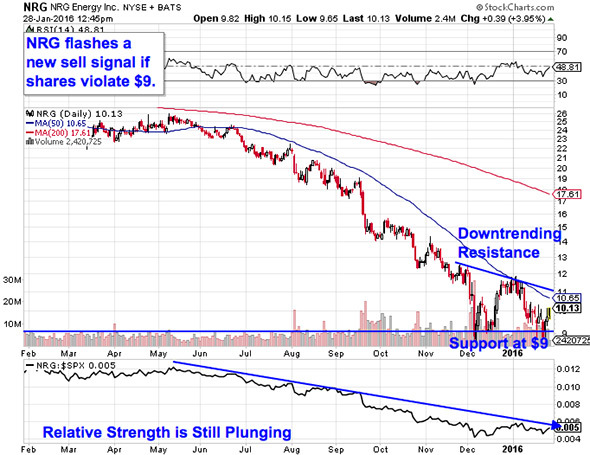 Relative strength, which measures NRG's price performance versus the broad market, is an extra red flag to watch here. Our relative strength line is still holding onto its downtrend from the beginning of last summer, which tells us that this stock is still underperforming the rest of the market in the long-term. 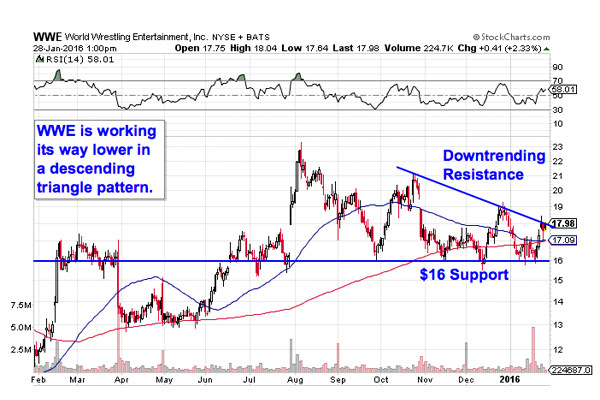 If you own shares of NRG, keep a close eye on support at $9. We're a little over a dollar away from that critical level as I write today. We're seeing the exact same price setup in shares of World Wrestling Entertainment (WWE - Get Report) right now, albeit with a bit of a twist. The downside in shares of WWE hasn't been quite as pronounced as NRG. In fact, shares of this pro wrestling league have actually been in rally mode for much of the last year. But a descending triangle is putting some major cracks in the rally. The key support level to watch here in WWE is $16. Why all of the significance at that $16 level? It all comes down to buyers and sellers. Price patterns, like this descending triangle in WWE, are a good quick way to identify what's going on in the price action, but they're not the actual reason a stock is tradable. Instead, the "why" comes down to basic supply and demand for shares. The $16 support level is a price where there has been an excess of demand for shares; in other words, it's a spot where buyers have been previously been more eager to step in and buy than sellers are to take gains. That's what makes a breakdown below $16 so significant -- the move would mean that sellers are finally strong enough to absorb all of the excess demand at that price level. If $16 gets busted, look out below. You don't need to be an expert technical trader to figure out what's been going on in shares of medical device maker C.R. Bard (BCR . 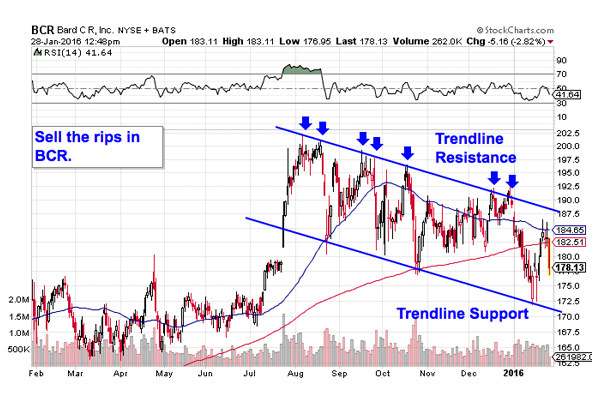 Instead, the price action in this large-cap healthcare trade is about as simple as it gets. Bard has been bouncing its way lower in a well-defined downtrend for the last six months now, and it makes sense to sell the rips as Bard keeps working its way lower. The setup in shares of Bard is formed by a pair of parallel trendlines that have corralled this stock's trading since the middle of last summer. Every test of the top of this stock's price channel has been a great selling opportunity so far, and that makes any near-term move higher in this stock look suspect. At the end of December, shares ricocheted off of trendline resistance for a seventh time; with that bounce in place, look out below as C.R. Bard moves back towards the bottom of its price range. Yesterday's earnings call could add a little extra volatility in shares of Bard this week, but the numbers don't look like they'll change shares' trajectory. Until this stock can catch a bid above $192.50 again, the downtrend is alive and well. The last year has been awful for MLPs, and $12.5 billion energy infrastructure stock Williams Partners (WPZ has been no exception to that rule. Williams has lost more than half of its market value in the last 12 months -- and it's already down more than 20% so far in 2016. The bad news for long-suffering shareholders is that this stock is still stuck in a downtrend this week -- and pointing lower. That may seem surprising, after all, Williams Partners appears to be in rebound mode this week. In the last five sessions, shares have rallied almost 20%, slingshotting off of their 2016 lows. But that upside action is a little misleading. While the lower range of Williams Partners' price action has been volatile, trend line support has been inviolate going all the way back to May. That makes a bounce lower in February more likely to happen than not. The 50-day moving average has been a good proxy for resistance over the last six months or so. 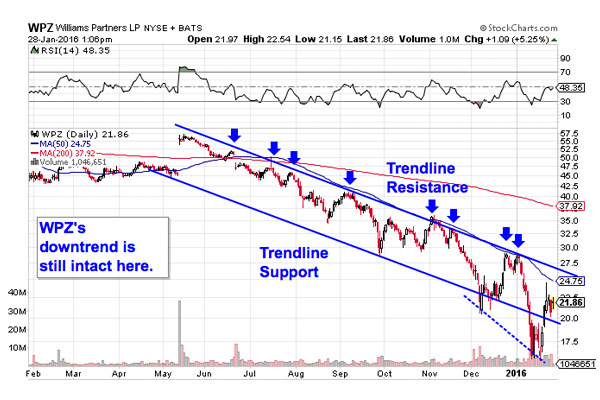 The downtrend isn't over until Williams Partners can catch a bid above that level again. Last up on our list of potentially toxic stocks is beverage giant Coca-Cola (KO - Get Report) . Coke has been a solid performer for the last several months, climbing about 10% higher since its lows last August. But shares are starting to look "toppy" in 2016 -- and that could spell near-term trouble for anyone who owns shares of this $183 billion stock. 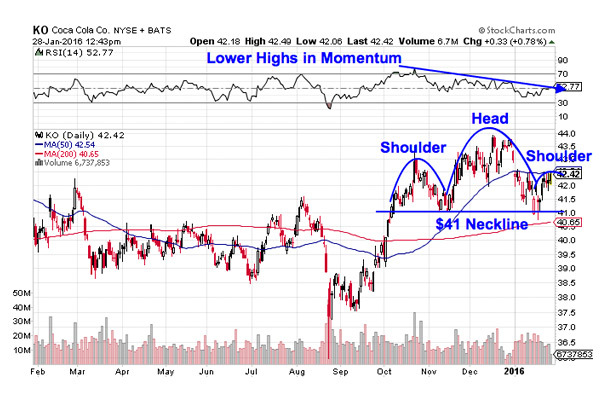 Coke has been forming a pretty textbook head and shoulders top back since the beginning of October. The head and shoulders is a price pattern that signals exhaustion among buyers. It's formed by two swing highs that top out at approximately the same level (the shoulders), separated by a higher high (the head). The sell signal comes on a move through Coca-Cola's neckline -- that's the $41 price level. Price momentum is an extra red flag to watch in the Coke trade right now. Our momentum gauge, 14-day RSI, has been in a downtrend since this pattern started forming. That's a bearish divergence from price that signals buyers have been quietly fading in shares of Coca-Cola since the fall. If $41 gets materially violated, Coke becomes a sell.